Mars. Gift this sumptuous bar of Mars Chocolate to our near and dear ones (3 Bars each 57 gms). 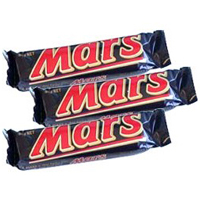 Mars (6 Bars each 57 gms). Gift this sumptuous bar of Mars Chocolate to our near and dear ones.